Tag line: "Pure Evil Never Really Dies"
As a follow-up to Dream Warriors, the entertaining third entry in the Nightmare on Elm Street series, 1988’s Dream Master is something of a letdown; while visually impressive, its story is far too convoluted, and Freddy Krueger, played once again by Robert Englund, is, for the first time, more comedic than he is frightening. Though she helped defeat Freddy Krueger a while back, Kristen (played this time around by Tuesday Knight) isn’t convinced the charred child killer is truly gone. Her fears are confirmed when her two close friends, Joey (Rodney Eastmas) and Kincaid (Ken Sagoes), both of whom also survived their initial run-in with Freddy, turn up dead. Now the last of the Elm Street kids (i.e. – a child of one of the angry parents who killed Freddy way back when), Kristen knows it’s only a matter of time before the psychotic killer gets her, too. So, when Freddy finally shows up, Kristen passes her special power (the ability to pull others into her dreams) on to her friend, Alice (Lisa Wilcox), who’s also the sister of Kristen's boyfriend Rick (Andras Jones). A compulsive daydreamer, Alice starts to encounter Freddy on a regular basis, often doing so while she’s still awake. In need of new people to scare, the crazed killer sets his sights on Alice’s pals, many of whom don’t survive the ordeal. Knowing it’s up to her to end this reign of terror, Alice searches for a way to defeat Freddy. But how do you kill someone who’s already dead? From the synopsis alone, you get an idea of just how complex Dream Master’s story can be, yet this is just the beginning (for example, whenever one of her chums falls victim to Freddy, Alice absorbs a portion of the newly-deceased’s personality, allowing her to mimic their actions and, on occasion, talk like they used to). In some cases, the film’s various twists and turns don’t make a bit of sense (why would Kristen bother passing her powers on to Alice, seeing as it was this that called her to Freddy’s attention in the first place? ), and while Alice, as played by Lisa Wilcox, is a decent heroine (I especially like the daydreaming angle, which lets her see Freddy even when she's awake), her friends are, for the most part, one-dimensional (the jock, the science nerd, the kung-fu fanatic, etc). As for Freddy, his one-liners are as annoying as they are dated (he often makes pop culture references that only someone who grew up in the ‘80s can understand). 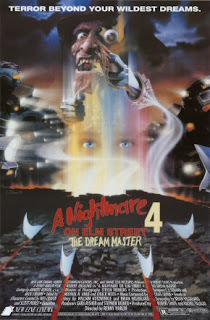 What saves Nightmare on Elm Street 4: The Dream Master from becoming a total waste of time is its imaginative visuals. Directed by Renny Harlin, the film features a handful of creative kills (one character literally has the air sucked out of them) and other wildly inventive scenes (the best of which is a dream sequence set inside a movie theater). So, even if the story gives you fits (like it did me), at least there’s something interesting to look at. Correct, this movie is propped up by its creative kills.